It may look like back-to-school night, but it’s actually Google Moms. Photo by Niv Kantor. It’s a Sunday night at Tel Aviv University and 10 women entrepreneurs are eagerly listening to Elena Donets, the passionate CEO of starTAU entrepreneurship program. She is giving a DIY guerilla guide to founding a startup. As Donets explores the ins and outs of UX and UI, we hear a dull thud of a breast pump in the background. Sharon Solomon, an entrepreneur creating a coupon aggregating and comparison site called Coupick, is extracting milk for her infant son Raz, now at home with Dad. This class is called We Dream, and it is targeted to help women make it in the predominantly male world of high-tech companies. Women found only nine percent of Israeli startups, and a smaller percentage get funding. Google Moms veterans include Solomon and her Coupick cofounder Maya Holtzer, a mother of three. Holzter, 40, and Solomon, 39, met when they started their Google Mom classes last October, the second round of the course. 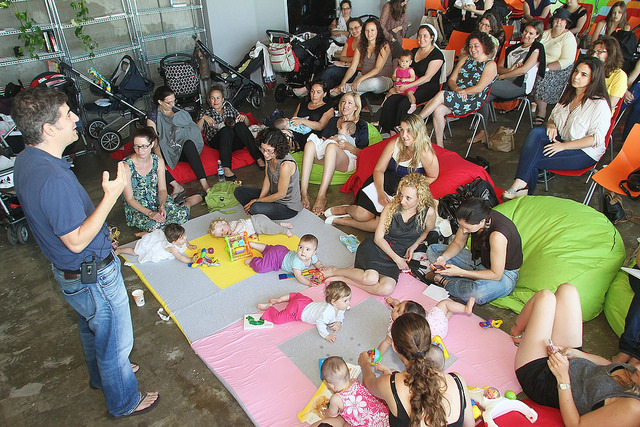 One day a week for 10 weeks, from 9:30am to 2pm, they and about 50 other women met at Google’s panoramic office in Tel Aviv –– with their small kids, if they chose. Google furnishes the women with expert seminars as they sit on poufy cushions and mats where the babies can roll around at leisure, getting nursed, burped and changed as needed. Coupick cofounders Maya Holtzer, left, and Sharon Solomon. Google Moms was created by successful Israeli entrepreneur Hilla Brenner, founder and past CEO of Whitesmoke. She worked with a friend, Google Israel Product Marketing Manager Tal Sarig-Avraham, to get the idea off the ground. The two friends were walking through the park one day with their kids when it dawned on Brenner that she could take skills from her women-only high-tech network, Yazamiyot, to give other women who wanted to start their own ventures. Sarig-Avraham pushed to get the concept accepted at Google. For Solomon, the timing was perfect, she tells ISRAEL21c. She was pregnant, had a toddler, and was looking for a productive way to use her three-and-a-half-month maternity leave. During the first leave, she says, her days were spent meeting with girlfriends and talking about their babies. With Raz, there has been a change: “I do the same things now with my girlfriends,” says Solomon. “Except this time it’s not just talk about pee-pee and ca-ca. Now it’s pee-pee, ca-ca and startups,” she smiles, while packing up her breast pump. She attempts to juggle Raz’s nursing and sleeping schedule with her husband, who is also trying to build a startup. “I knew I would have an opportunity and time to work on a startup during my maternity leave. My mission was to learn about startup goals and to meet people who were at my stage of development,” says Solomon, who has been working at startups and tech companies for 15 years. At the end of their Google Moms session, Solomon and Holtzer won the demo day competition, earning $20,000 worth of Google Cloud services and a slot in the esteemed Google Launch Pad program – which unfortunately is not open to babies. Before they met, Holtzer had been trying to get a startup going through Facebook. “I wasn’t wasting my time, but I was working needlessly and not going anywhere and felt stuck. I felt I needed a direction and framework and some new tools to take me forward,” she tells ISRAEL21c. She’d heard of the women’s venture support network Yazamiyot, and they let her know about the program starting at Google. Women in Israel have, in some ways, a harder time starting up ventures. The social norm is to marry young, and have a career and children by age 30. Life plans are usually delayed by two or three years or more, because of army service, the almost “compulsory” post-army trip, and university. Google Moms and other programs like We Dream offer the right framework, while not compromising on any of the perks offered in the usual networking channels. Based on the resounding success in Israel, Google is now launching moms-only programs in London, Berlin and Moscow, says Brenner, whose own new company is called Keydownloads. Next Article Study: Want Smarter Children? Try Raising Them Bilingual!